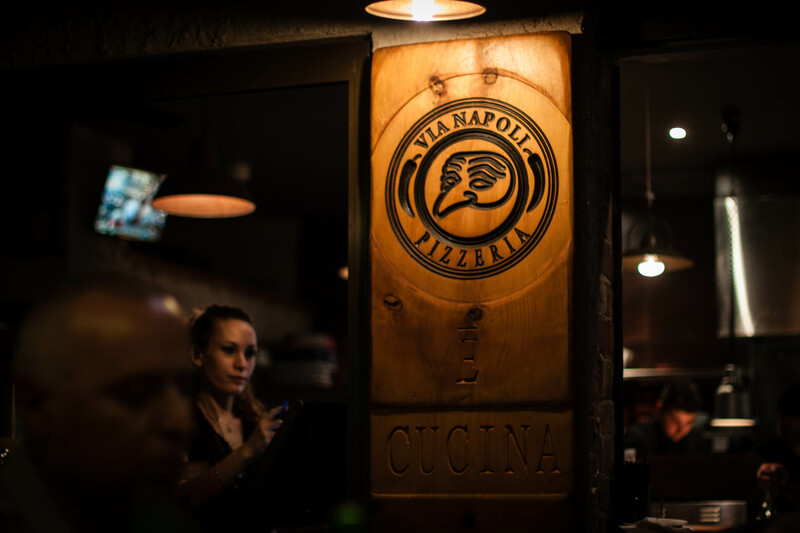 Vanessa: If you have ever wanted to experience the culture and flavor of southern Italy but haven’t made it there, then a trip to Via Napoli Pizzeria in Lane Cove is a must! This bustling suburban pizzeria not only serves some of the tastiest (and largest) wood fired pizza in Sydney, the charismatic wait staff ,who mostly hail from Italy’s southern state of Naples, ensure you will have an authentic experience as well. My family, including fellow FFS bloggers Bianca and Alex, recently dined their with our visiting French relatives. Now whilst they live in the south of France, we obviously share the Italian heritage so their love for Italian food runs as deeps as ours. We told them we were taking them to a pizzeria that specializes in southern Italian staples such as buffalo mozzarella, polpette di baccala (potato and salted cod fritters) and of course wood fired pizza. What we didn’t tell them was to expect to feel more like we had taken them out to a local pizzeria in Naples, rather than suburban Sydney. Needless to say they were surprised (perhaps a little confused) but their faces suggested they were excited to see what the night had in store! 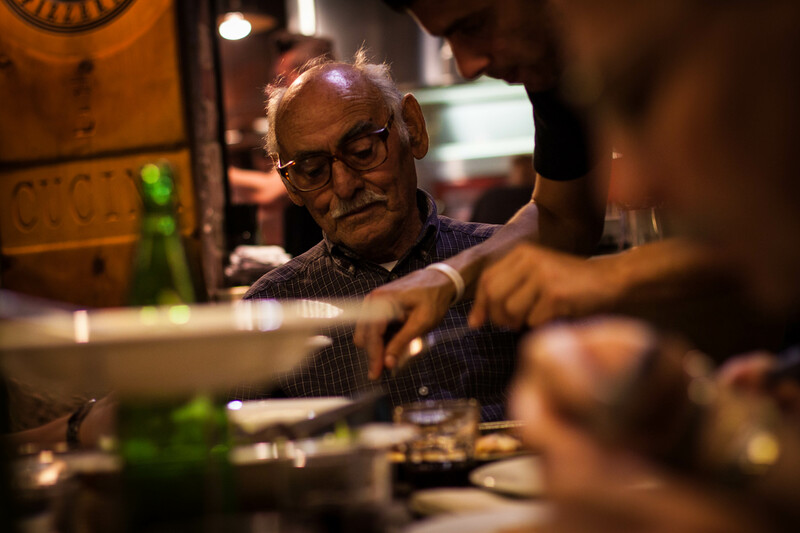 We were greeted by our boisterous waiter, Fabio, who instantly relished in being able to speak his native tongue with all of us but in particular our Nonno. Fabio sat us down and started telling us about the specials, more in a over dramatised story like fashion….which made the food sound too appealing to resist! He spoke of blue swimmer crab spaghetti with cherry tomatoes, olives and fresh capers. The second special was a rock cod poached with tomatoes, capers, olives and oregano served with softly baked potato slices. The fish sold my mum over and that was coming our way. 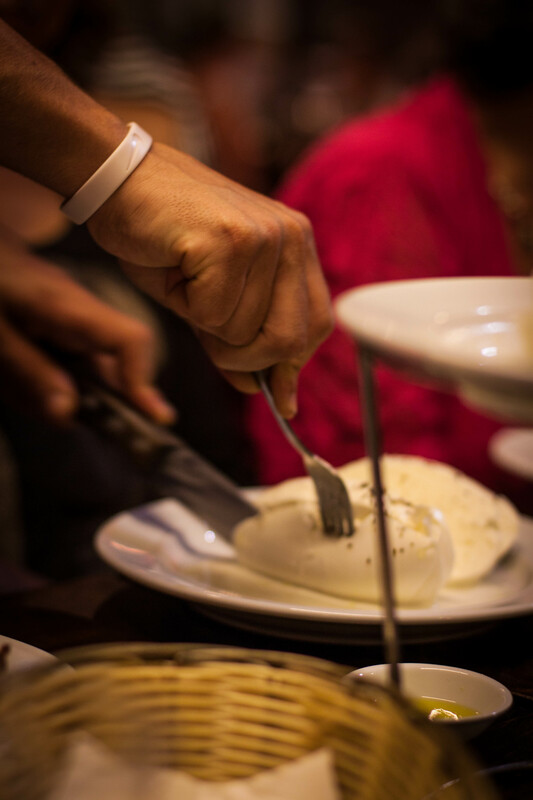 I was charged with ordering for the table so first up I chose the house buffalo mozzarella which is large enough to easily serve 5-6 people. 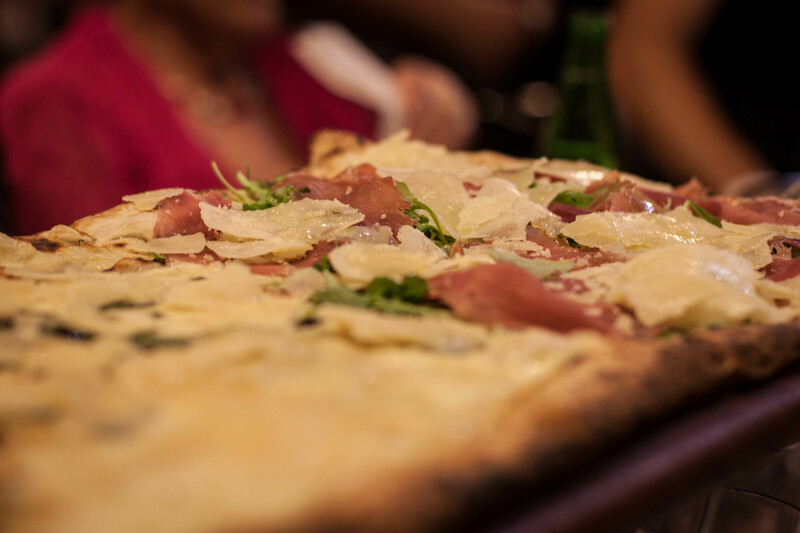 It sits a top layers of thinly sliced prosciutto crudo and is served with house made bread. The mozzarella is so fresh it oozes a small amount of milk when cut, so Fabio advised we remove it from the plate so as not to ruin the prosciutto – smart move. This is an absolute must dish in my opinion. I can’t recall ever having mozzarella as fresh (or as large) as this anywhere else in Sydney and it instantly took me back to the days I have spent in Italy. The house special of rock cod came out next and Fabio took to serving each of us a portion. Whilst I enjoyed it for its flavor, I was more interested in trying the pizza. 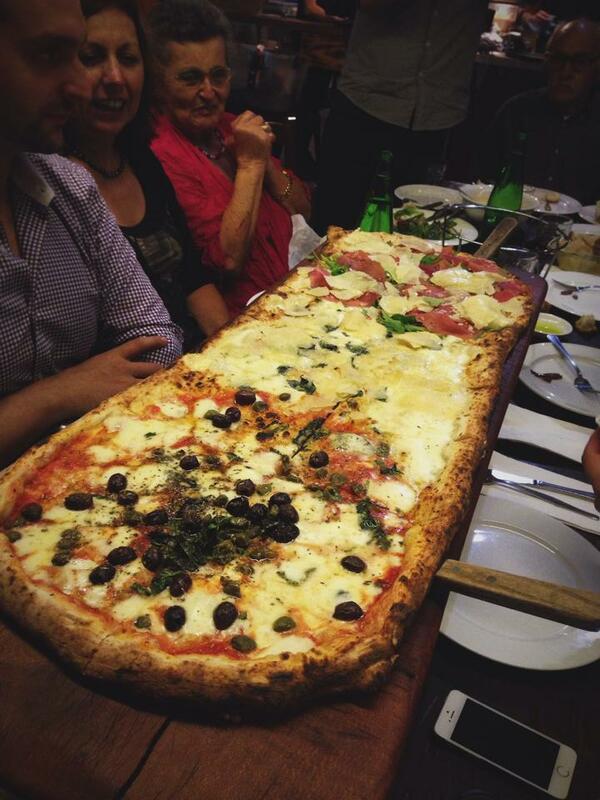 We had ordered two meter-long pizzas for the table. Served on wooden boards, each pizza was divided in thirds with three different styles. We went for the Napoletana, the Quattro formaggi and the prosciutto e rucola. One word…DELICIOUS! I found the pizzas to be incredibly generous in size and with more than ample toppings. We made a pretty good job of getting through the pizzas but alas there were still some left over..which no doubt delighted my father who was the receiver of the “doggy bag”. There is also the option of the two meter pizza which would comfortably serve between 12-15 people…so you can imagine the shock on the table of six girls behind us when they were presented with this epic slab! The meal was topped off with a complimentary round of house limoncello, a lighter variant than others I’ve tried. This trip to Via Napoli Pizzeria was an unforgettable experience for our French family and an entertaining evening for all of us. We will definitely be returning! One final note…if it’s a quiet or romantic dinner you are after..then this is an outing best saved for a rowdier affair. Hehe I’d love to try that 2 metre pizza! I think hubby could give it a go but I don’t think he’d come anywhere near finishing it. He loves pizza! I think the 2 Metre is definitely worth a try Lorraine…with your hubby and about 10 friends! I really can’t fault the pizza here.. I can’t wait to go back!